Dogged perseverance and unyielding determination are qualities shared by countless bands struggling to break out from their hometown club scene and onto the arena stage. Memphis, Tennessee quintet Savage After Midnight have exhibited far more patience and dedication than most. 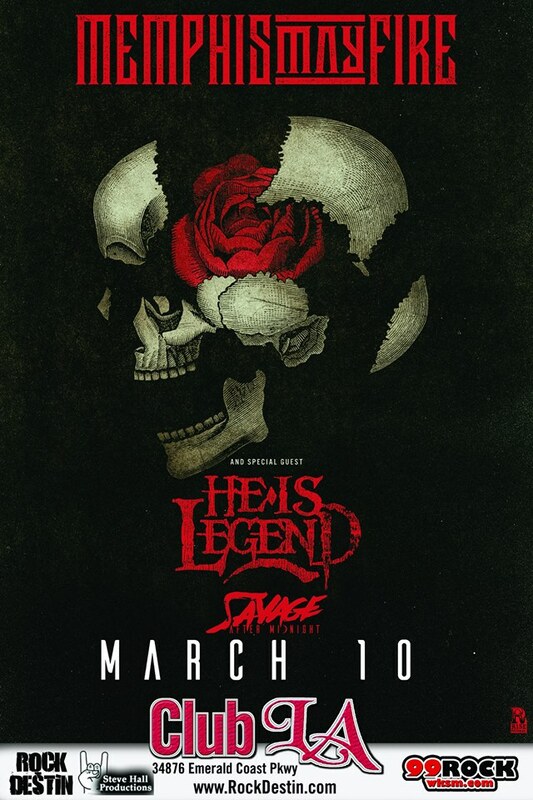 They are gearing up for the release of their debut EP, “11:59” (RED Music/The Century Family) on March 8th, 2019 with a run of tour dates with Memphis May Fire. The years of trial and error, and even more years of being uprooted and returning to square one made Savage After Midnight a more professional band, improving their chemistry and allowing them to fine tune their presentation both live and in the studio. The band connected with producer John Falls (Egypt Central) and recorded what would become the “11:59” EP. The band’s “work-hard-by-day, rock-harder-by-night” ethos is poured into a collection of songs that are an energized, emotional introduction to musicians that desperately want to make a mark, but only on their own terms. S.A.M. music is aggressive, but still has pop sensibilities. The tracks are colored by galvanic hard rock passages, a contrast of screamed melodies and soaring hooks, and it’s augmented by electronic segments that give the band a modern edge. “10 Feet Tall,” the first single and video release from the EP, is already making inroads at SiriusXm Octane and Music Choice. It’s anthemic and energizing, building from a melodic verse, through a propulsive bridge and into an unforgettable chorus. “Unleash,” the opening cut on the EP, is a message of empowerment in the face of adversity, driven forward by steady backbeats, chugging guitars and electronic effects. “Heartless Machine” is an intense song about soldiers who are sent to war and desensitized, trained so that they will obey commands that civilians never have to contemplate. Savage After Midnight has toured with Shinedown, Sick Puppies, Pop Evil, and Story of the Year, among others. The band will be touring thorughout 2019, and additional songs have been recorded for another EP to be released late this year or early 2020. Living up to the band’s name, leader Shi admits: “We all like to get wild. There’s something savage about us when it comes to throwing down and partying – it’s just who we are. We work really hard, but at the end of the day we’re down for a good time. We’ll put on whatever work hat we have to, but once it strikes midnight it’s our time – and it’s time to tear it up!” 2019 will be the year that Savage After Midnight tears through the rock world and at long last makes it mark. This entry was posted on March 5, 2019 by 850music in Posts and tagged press release.